One cruel night, Meggie's father reads aloud from Inkheart, and an evil ruler named Capricorn escapes the boundaries of the book, landing in their living room. Suddenly, Meggie's in the middle of the kind of adventure she thought only took place in fairy tales. Somehow she must master the magic that has conjured up this nightmare. Can she change the course of the story that has changed her life forever? Anyway! It’s always difficult for me to pinpoint why my favorite books make it onto a favorite list. There are always so many things to like about the favorites! Number one for this particular book is going to have to be the story, I think. I’ve talked about my love of The Neverending Story here before, and this book is rather similar, at least in my reasons for liking it. 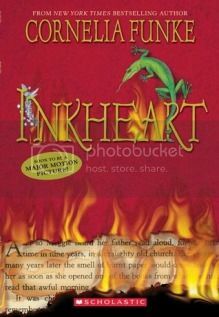 Who wouldn’t love the chance to meet their favorite characters, even if they do turn out to be nasty little idiots like some of the ones in Inkheart? Usually for me writing style plays a part in liking a book. I feel bad talking about it in this instance, because in all likelihood the style is more up to the translator than the writer on a book written in a different language than I speak. But, on the other hand, the translator has to know what they’re doing to do a good job on it, and they do have to faithfully translate the story, so I’d like to think it’s a joint effort, and it is very pretty. The style really suits the novel – it’s not one of those that makes me want to read out loud (and isn’t the story warning enough against that?) but the language matches who the characters are really well. Most of us chronic readers have a pretty extensive vocabulary and aren’t afraid to use it, and that shows really well with Meggie, Mo and Elinor, while Capricorn’s men are completely illiterate and the sections about them show that, even when there’s no dialogue. The only thing I will warn you about is these are large books. They’re fairly easy to read the first time around, but the size and lack of “gotta know what happens!” made it more difficult to get through this time. I carried it with me in case I needed a book, but given the choice of Inkheart or some other, newer book, I often chose the new book. On the other hand, if you haven’t read this series, you really are missing out. Go find yourself a copy!